← Happy 2014 from JiC (Plus Predictions)! A Snowball’s Chance in Cairo: The ICC To Intervene in Egypt? The legal battle is led by a team in London that includes one of Britain’s top international criminal lawyers, a former official with the United Nations and the former director of public prosecutions in Britain. The lawyers have not only filed a complaint with the ICC alleging widespread crimes against humanity by the military, but they also plan to file a series of lawsuits around the world targeting individual Egyptian army officers. The most obvious obstacle to the ICC intervening in Egypt is the fact that the country is not currently a member-state of the Court, despite occasional proclamations that it would sign and ratify the Rome Statute. Thus, for the ICC to investigate any alleged crimes committed in Egypt, one of two things would have to occur: First, the UN Security Council could refer Egypt to the ICC. It goes without saying that that is not going to happen; such a referral is not on the Council’s radar. Second, the Egyptian government could voluntarily refer a particular event or time-period to the ICC, even if Egypt is a non-member state. There is precedence for this. Despite not being a member of the ICC, Ivory Coast accepted the Court’s jurisdiction in April 2003. Thus, beyond an intellectual exercise, it would be hard, if not impossible, to argue that Morsi was the rightful President of Egypt who could request the ICC to investigate alleged crimes committed in the country. But there is another issue to consider here: does the ICC have any interests in intervening in such a case? After all, the filing has been made and at some point (likely in the distant future), the Court’s Office of the Prosecutor will have make an official decision to open an investigation or not. 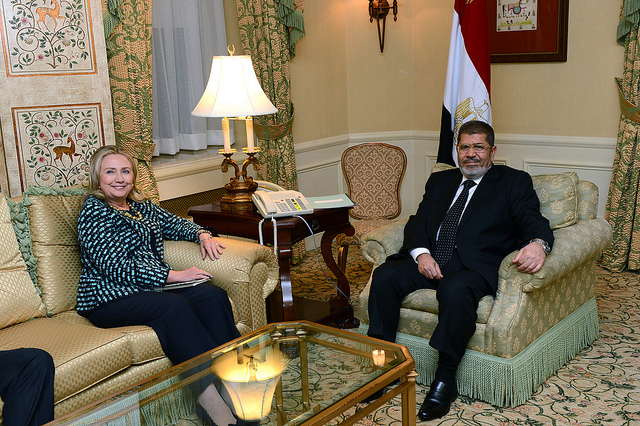 As suggested above, the Muslim Brotherhood’s legal team has wrapped issues of democratic impropriety (who the rightful leader of Egypt is and whether the coup was legitimate) up in issues of international criminal law. It is a bold move and perhaps a politically intelligent one insofar as it seeks to bring added publicity and attention to ongoing events in Egypt as well as earn sympathy for the Brotherhood. But the ICC has been very hesitant to take on such highly controversial politicized cases. For example, when the Palestinian National Authority requested that the ICC investigate alleged crimes committed in relation to the ongoing conflict between Palestine and Israel, the Court dragged its feet. Then Prosecutor Luis Moreno-Ocampo was wary of intervening because to do so would have been tantamount to accepting that Palestine was a state, a political as much legal decision that the Prosecutor clearly felt very uncomfortable with. As a result, the Office of the Prosecutor declared that it could not investigate any alleged crimes until the question of Palestine’s statehood was resolved. It was a pragmatic decision which avoided steeping the Court in a highly political debate that it could never win. Indeed, most believe it was the right decision – although it remains remarkable that it took the Prosecutor two years to come to it. As in the Palestinian case, an intervention in Egypt would not serve the institutional self-interests of the ICC. It would embroil the Prosecutor in questions of democratic legitimacy which she is in no position to answer. Like in the Palestinian case as well, it could take a very long time before we hear what the Office of the Prosecutor actually thinks. This entry was posted in Egypt, International Criminal Court (ICC), Palestine, Palestine and the ICC and tagged Mohammed Morsi, Muslim Brotherhood. Bookmark the permalink. 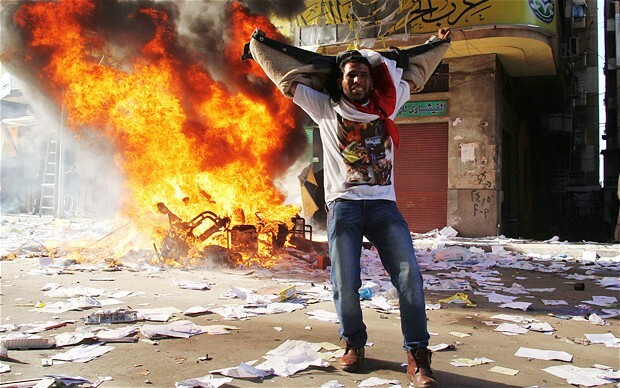 4 Responses to A Snowball’s Chance in Cairo: The ICC To Intervene in Egypt? Very briefly and shirt-sleeved: this application is far more about political gain and propaganda efforts, than about any serious legal endeavour in International Criminal Law. It may not be exactly “necessary” to be familiar with Carl Schmitt’s terminology (as many American political scientists are, and few Common Lawyers), but it may help a lot in understanding the real issues here.